Burn, melt, drip, spit, rust, scrape, gouge, grind, tarnish—these are the actions that give life to Walker Babington’s “creatively destructive” art. Discarded and distressed materials have always drawn the artist’s eye. Scrapyard metal selectively scraped and ground with tools rusts into a portrait. A piling encrusted with barnacles begs the artist to abrade until a face emerges from the negative space. Babington has even set himself afire, becoming a flaming human paintbrush to create his piece Fire Angel. While ablaze, the artist mimicked the actions of a child making a snow angel while lying facedown under a panel of salvaged wood, burning a human image into it. Babington’s gift for seeing the artistic potential in abandoned odds and ends began with what he called his childhood “yunk collection.” Everywhere the young artist went, he collected scraps of wood, metal, hardware, and other discarded treasures. Out of this detritus came the creation of one of his first sculptures, Happy Citizen. Assembled by Babington when he was in fifth grade, the wall sculpture looks like a small robot wearing a police badge. He created it as a garage talisman to bring his father good luck with hammers and saws. Despite losing an eyeball somewhere along the way, the little robot still keeps watch over the Babington garage. 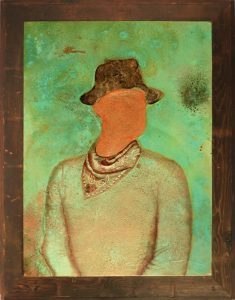 While pursuing a photography degree at University of Maryland Baltimore County, Babington discovered that he liked to recreate his photographic subjects using a blowtorch or a magnifying glass to burn images—often portraits—onto reclaimed wooden doors, tables, and pallets. He dubbed this process torchtraiture. 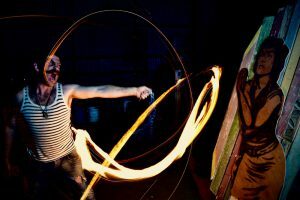 After traveling internationally, creating and selling art and continuing to add new processes and materials to his arsenal, Babington combined his love of fire with his proclivity for risk taking and attended the United Stuntmen’s Association International Stunt School in Seattle, Washington. His stunt résumé lists, among other skills, “Armed combat—club and dagger,” “Japanese pole,” and “Walking on hands (can go up stairs).” Learning the proper way to execute stunts made Babington a more responsible performer. His training led to work in advertisements, music videos, and feature films. He acted as Sam Rockwell’s stunt double in Better Living through Chemistry, filmed in Annapolis, and had speaking roles in The Magnificent Seven and Strange Weather. Currently living in New Orleans, Babington and his wife, filmmaker and screenwriter Shana Betz, are frequent artistic collaborators. They also became first-time parents last fall, necessitating significant changes in their schedules and lifestyle. “You can imagine how many sharp objects I normally have lying around,” he jokes. Between acting, stunt gigs, and changing diapers, Babington sells his art in New Orleans’ Jackson Square, where artists have been producing and selling art for close to a century. There, spectators watch Babington create his heliography. He also makes large-scale fire murals using a blowtorch on wood. Some of these murals are installed at the Catahoula Hotel and the St. Claude Art Garage, both in New Orleans. “Faraday” (2018) 42″x56″ liver of sulfur, ammonium chloride, cupric sulfate, and sodium bicarbonate on copper. He feels an imperative to explore and create processes involving new materials. Wielding a blowtorch and chemicals with fantastical names such as Liver of Sulphur, Babington is learning to selectively patinate images onto brass, bronze, and copper. “This process . . . creates a wild green flame that looks like some kinda Harry Potter sh–.” Consulting with an architect and an engineer to ensure his creations’ structural integrity, Babington is also pushing himself to go big with his sculptural work. He is developing three-dimensional pieces that he hopes to see come to fruition in New Orleans and Annapolis. Walker and Willa at the levee; photo by Pieter Gasperz. Kris (2008) 38″x52″ Fork on tabletop. burning of the “Baba Yaga Hut” (2015) 10’l x 6’w x 20’h Mixed reclaimed materials Southern Louisiana-fire. “Baba Yaga Hut” (2015) 10’l x 6’w x 20’h Mixed reclaimed materials Southern Louisiana. “Skerling” (2007) griptape on skate decks. Fire Angel (2014) my body in flames, scorching a “fire angel” into a panel of reclaimed wood. Blowtorching “Harvest,” photo by Pieter Gaspersz. “Trixie” 8’x32′ burnt wood and tarnished copper, commissioned by The Catahoula Hotel in New Orleans, LA. “Mt. Varé” (2018) 42″x56″ liver of sulfur, ammonium chloride, cupric sulfate, and sodium bicarbonate on copper. Walker and Willa at the levee 2; photo by Pieter Gasperz. “Kaleidoshack,” (2017) commissioned by the Bonnaroo Music & Arts Festival. 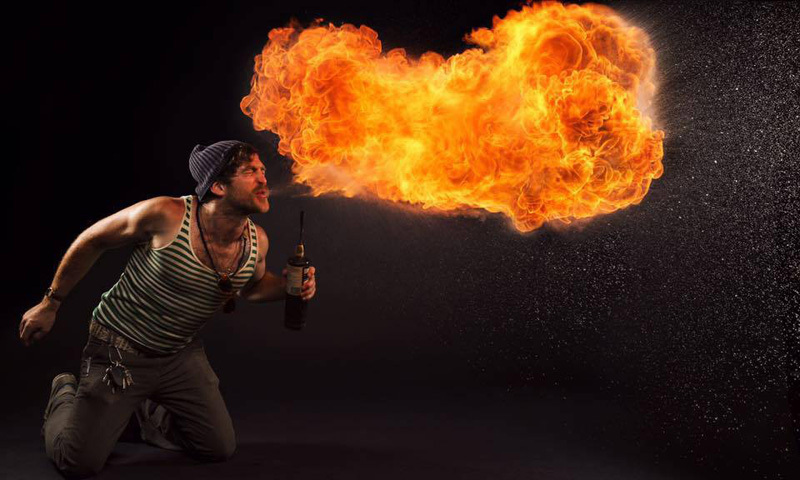 Breathing fire; photo by Rich Wysockey. Error: Error validating access token: Session has expired on Saturday, 09-Mar-19 15:57:50 PST. The current time is Tuesday, 23-Apr-19 08:53:12 PDT.